Cyclopentasiloxane is an ingredient Food Babe says is toxic and cancerous. But it’s found in the Tarte Lights Camera Action mascara she’s selling. Vani Hari (the “Food Babe”) heavily censors all commentary on her web and social media sites.1,9 On Facebook those who legitimately question her statements are banned, with their commentary deleted. On her web site no comments can be posted without their first being approved by Hari or a moderator. Criticism–no matter how factual and polite–is not allowed. With this in mind, I think it’s only fair that we hold Vani responsible for the content of commentary that she does approve. On a heavily censored, moderated web site, I would strongly disagree. But to be honest, I just like yanking the Food Babe Army’s chain. As the Facebook group “Banned By Food Babe” has so thoroughly documented,1,9 Food Babe and her moderators heavily censor all posts on her web and social media sites, so it is more than reasonable to hold Vani Hari responsible for statements that she does approve–including those about cyclopentasiloxane. 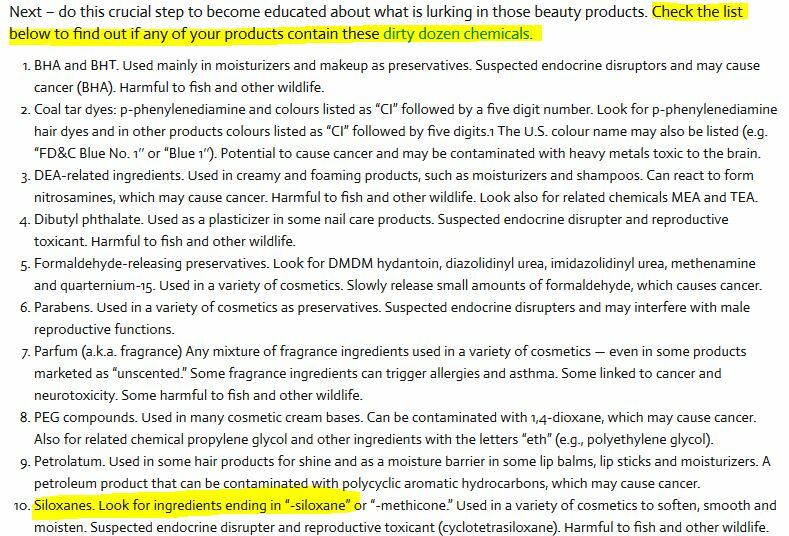 So Vani Hari earns a sales commission from a cosmetic that contains this compound, says it’s dangerous, and urges her “army” to use a database that links it to tumors in animals.8 Brilliant. But… is Tarte Lights Mascara really dangerous? I am not a professional chemist. But, like you, I can use my university education as a foundation, read and evaluate information (from experts) on cyclopentasiloxane,10 and make an informed decision. Spend some time reading the scientific references in the “Toxicity” section of the PubChem writeup on cyclopentasiloxane,10 and I predict you’ll be unafraid. Very unafraid. Vani seems to have once again cherry picked scary looking quotes to terrify you about other products–in order to sell you her own. So, please buy Tarte Lights Mascara. Just don’t buy it via a FoodBabe.com affiliate link. Amazon.com and Tarte product, and Food Babe screen snapshots are used in accordance with Title 17 U.S.C. Section 107, commonly known as “fair use law”. This material is distributed without profit with the intent to provide commentary, review, education, parody, and increase public health knowledge. Well+Good and other web site screen snapshots are used in accordance with Title 17 U.S.C. Section 107, commonly known as “fair use law”. This material is distributed without profit with the intent to provide commentary, review, education, parody, and increase public health knowledge. This entry was posted in Food Babe and tagged beauty, debunked, food babe, health, mascara, science, skepticism, tarte, vani hari by Mark Aaron Alsip. Bookmark the permalink.